YOUR_APP_UNSUBSCRIBE_HANDLER is the webpage where we will redirect the user once they click on the unsubscribe link, e.g. the "Sorry to see you go" page. List unsubscribes are triggered from within the email client when a customer clicks on the Unsubscribe button in the email client. Every non-transactional email from SparkPost has a properly formatted List-Unsubscribe entry in the email’s header. 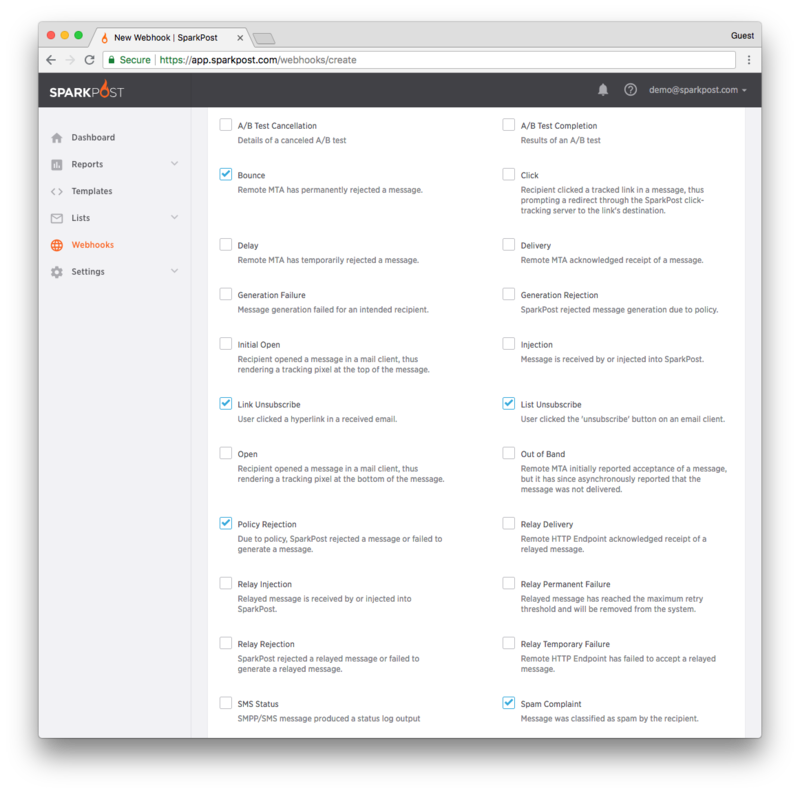 To use this feature, you just need to listen to the list-unsubscribe webhook events. You have one or more recipients who have opted-in to your one-to-many emails (such as a newsletter). You are good email citizens and have included CAN-SPAM information in your one-to-many (bulk) email transmissions. The CAN-SPAM information contains an Unsubscribe link as required. A targeted recipient no longer wishes to receive email and clicks on the Unsubscribe link in your email (opt-out). A targeted recipient no longer wishes to be part of a distribution list and clicks on their email client’s Unsubscribe feature to stop receiving (opt-out) of messages from this list. Our Suppression List API provides an easy way for developers to manage the list of people who SHOULD NOT be delivered email during non-transactional transmissions. SparkPost’s List Unsubscribe and Link Unsubscribe event types added to the Message Category Webhook (see Webhooks API for more information, in particular the Event-To-Field Mapping for Message Events Category) make it easy for your mobile/web application to monitor for these events and take the appropriate action for that recipient. Once your webhook has been created or updated, you will want to verify the webhook is validated and the consumer is ready to start receiving the updated payload.